It is argued that the words in the post-Conciliar Pontifical for Consecrating a Bishop are insufficiently precise. But that prayer was used for centuries by Oriental communities in communion with Rome, and dissident communities whose orders the settled praxis of the Holy See for centuries was to accept. It was on this ground that Archbishop Lefebvre himself, upon receiving fuller information, changed his mind and accepted that this prayer was adequate to confer the episcopate. It is argued that the phrase spiritus principalis is insufficiently precise because it is used in some dissident communities in the prayer which is said over a man who is already a bishop but is now being constituted a Patriarch. So ... are you, O ye sedevacantists, saying: "Originally this prayer, used for centuries to consecrate bishops, was adequate; but now, since some dissident communities began to use it for a different purpose, it has become insufficient, even in those communities where it is not used for blessing Patriarchs?" If so, I would regard this argument as absurdly and unconvincingly rococo. Before going on to my next section, I think I had better point out out that it is very easy indeed to construct immensely attractive arguments for dismissing the Orders of people one doesn't like; the grief comes when the question is asked: "You deployed that argument to prove that X's Orders are invalid; but the same argument proves also the invalidity of the Orders of Y and of Z and, indeed, of you yourself and the clergy whose ministrations you depend upon." If you want to shoot off such arguments, my advice is: go to the middle of a large empty field with good lines of vision; discharge your arguments; then keep your eyes and ears wide open for the sound and sight of the returning boomerang. It has sharp edges. Pius XII (1947) laid down that the Form in the (then) Roman Pontifical for consecrating a Bishop was Comple in sacerdote tuo ministerii tui summam etc..
(1) Are you quite sure, O thou sedevacantist, that this is explicit enough? If I have up my sleeve (I'm not saying I do) an example of a medieval pope who, already being a bishop, had this read over him when he was promoted to the See of Peter, would you conclude that it automatically became too vague to signify the Episcopate? If not, why not? (2) And if I have up my sleeve early manuscripts of this prayer (I'm not saying I do) which read mysterii rather than ministerii, will this variant still be explicit enough for you? If not, will you admit that very many medieval bishops, consecrated with the use of this form, were not validly consecrated, including almost certainly many popes? If not, why not? 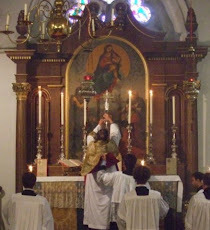 (3) And if I have up my sleeve (I'm not saying I do) a medieval rite of presbyteral ordination in which that same formula was used to ordain a mere priest, would you still be consistent enough to advance the argument that the words, since they were used in a context other than episcopal consecration, manifestly do not univocally signify the episcopate? And that therefore most, if not all, medieval and later Western bishops were not validly ordained? If not, why not? Be careful how you answer those questions: I have capacious sleeves. To be concluded. I will not enable comments until after the next and final installment.